The Rare Books and Special Collections (RBSC) Division holds and manages the majority of the Library’s rare books, maps and manuscripts with a special emphasis on material related to British Columbia. Working with the RBSC Archivist, the Forestry Archivist is responsible for processing our forestry related records. Work will include appraisal, arrangement and description, and creation of RAD compliant finding aids as well as assessing conservation needs of materials and undertaking preservation tasks. A Graduate Degree in Archival Studies (MAS), or equivalent from an accredited school of Library, Archival and Information Science. Experience working with archival material in all formats including born digital and digitized documents. Strong interest in and demonstrated broad knowledge of B.C. and Canadian history and current affairs. Excellent ability to speak, read and write English. The ability to work in a collaborative team environment and engage with professional and library assistant staff and the public is required. Dedicated to cultivating an inclusive environment that recognizes barriers faced by people and encourages and incorporates contributions from diverse groups and individuals. Contributes to the Library’s sense of community and achievement of common goals through cooperation across units/groups and encouragement of equitable and balanced involvement in decision making. Promotes and fosters a supportive environment built on appreciation, recognition, learning and professional growth. Works to build a team environment built on positive working relationships, provides guidance and resources to teams while trusting them to excel. Creates a supportive and open environment where everyone is able to listen, contribute and engage with colleagues and ideas and provide and receive timely, constructive feedback. Creates an environment that embraces curiosity, ideas, creativity and innovation and provides opportunities and flexibility to explore new initiatives. A second degree in History is desirable. Previous experience working in a rare book or library special collections environment would be an asset. This position reports to the Head, Rare Books and Special Collections and works closely with the RBSC Archivist and other professionals in the Division and the Library. Based on a strong understanding and familiarity with the Archival holdings at RBSC, documents the overall organisation of Archival holdings; refines and updates existing records to current standards. Evaluates, acquires, accessions, arranges and describes archival fonds. Prepares, or oversees the preparation of finding aids for current and backlog archival fonds and maintains, upgrades and updates existing finding aids. In co-operation with other RBSC staff ensures the physical security, preservation and conservation of RBSC archival collections. Oversees library assistants and student assistants carrying out specific work on archival collections; oversees the practicum work of SLAIS students and summer students on archives and manuscripts. Provides general reference service for Rare Books and Special Collections. Performs other duties as necessary including participating in Library committees, professional, and University initiatives. This position will be filled as a full-time, term position of one year. We are seeking applications from Archivists with up to 3 years of experience. However, all internal candidates will be considered regardless of years of experience and are encouraged to apply. Salary will be commensurate with experience and academic/professional qualifications. To view the complete job description and to submit an application, please visit the UBC Careers page at http://www.hr.ubc.ca/careers-postings/faculty.php by midnight on March 10, 2019. Join us in looking back at the Irving K. Barber Learning Centre's past 10 years from August 27 through October 30, 2018 in the IKBLC Level 2 foyer and in Rare Books and Special Collections. Take a rare glimpse into Japan in the 1890s-1920s through the photographs taken by a Canadian missionary, John Cooper Robinson. We can only begin to understand Cooper Robinson’s photographs by overlaying both Canadian and Japanese historical contexts and perspectives. Join our symposium led by art historians and historians who specialize in Japan and Canada, to explore ways in which the Cooper Robinson photographs can be used and made relevant for future research and teaching. Symposium attendees will have the opportunity to visit the ongoing curated exhibit at Rare Books and Special Collections (RBSC). Register here for this event! Allen Hockley is Associate Professor of Art History at Dartmouth College. He specializes in early Japanese photography and woodblock prints and illustrated books from the Tokugawa through early Showa periods. A. Hamish Ion is a professor emeritus in the History Department, Royal Military College of Canada. He is a specialist in modern Japanese history. Ignacio Adriasola is assistant professor in the Department of Art History, Visual Art, and Theory at the University of British Columbia. Tristan Grunow is assistant professor without review in the Department of History at the University of British Columbia. 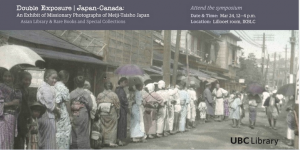 The Asian Library and Rare Books and Special Collections and are delighted to host a symposium to launch our current exhibit Double Exposure | Japan-Canada: Missionary Photographs of Meiji-Taisho Japan. This event is made possible through generous support from the Center for Japanese Research, the UBC History Department, the UBC Library, and nominal support from the Consulate General of Japan. 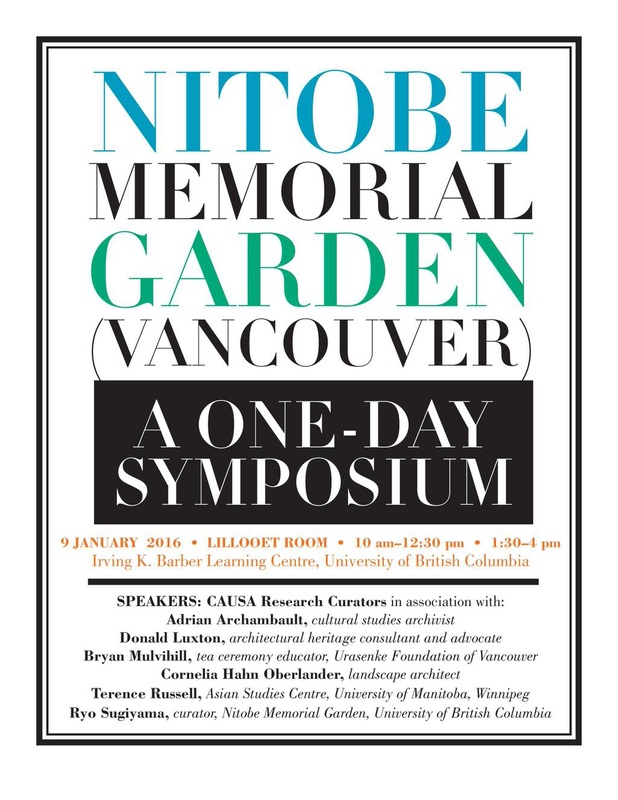 For more information, please contact Japanese Language Librarian Naoko Kato at naoko.kato@ubc.ca. The Collective for Advanced and Unified Studies in the Visual Arts (CAUSA) presents a one-day symposium on January 9, 2016 from 10:30am-5:30pm. Speakers will touch on topics such as observations and reflections concerning “problems of authenticity” and “factors of futurity” within both the socially engaged practice of landscape architecture and its continually rigorous conservation and revivification. Affiliated with the University of Manitoba, Winnipeg, CAUSA aims to develop autonomous scholarly analysis and interpretation of visual culture (including problems of intelligibility) within specific historical contexts. CAUSA functions in association with a ‘global village’ network of independent and institutional scholars – in tandem with a pluralistic community of socially engaged contemporary artists. CAUSA sustains a continuative process of philosophical reflection by connecting its program of research to an expansive glimmering that was first formulated by Marshall McLuhan, a Canadian philosopher of communication theory. UBC Library is proud to commemorate the 150th anniversary of the publication of Alice’s Adventures in Wonderland with a new exhibition featuring items from Rare Books and Special Collections’ Alice 100 collection. – Charles van Sandwyk, Sketches from the Dream Isle of Birds. 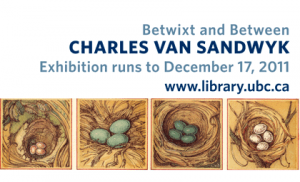 UBC Library’s Rare Books and Special Collections is pleased to bring you the exhibition Betwixt and Between: The Art and Influences of Charles van Sandwyk. Born in South Africa in 1966, Charles van Sandwyk is an internationally celebrated artist and illustrator. He gathered worldwide acclaim after illustrating the 2005 edition of Kenneth Grahame’s The Wind in the Willows, and is the author and illustrator of several books including The Parade to Paradise, How to See Fairies and Sketches from the Dream Island of Birds. The exhibition explores some of the connections between van Sandwyk and the artists, writers and teachers who inspired his artistic career. This is not the first time van Sandwyk has paid homage to his influences. For his 2007 publication Twenty One Years, Twenty One Prints, van Sandwyk named each limited edition book after one of his major artistic influences. The exhibition is hosted in UBC Library’s Rare Books and Special Collections, located on level one of the Irving K. Barber Learning Centre. The exhibition is free and open to the public Monday through Friday, 9 a.m. to 5 p.m., from November 3 until December 17, 2011. For more information, please contact Ralph Stanton, Head of Rare Books and Special Collections, at ralph.stanton@ubc.ca.